Kampala/ Entebbe to Fort Portal is a five hour drive, on well surfaced road but plagued by bus coachesspeeding on the roads. Fort Portal is really the springboard for excursions to Kibale Forest and the Semliki Valley. 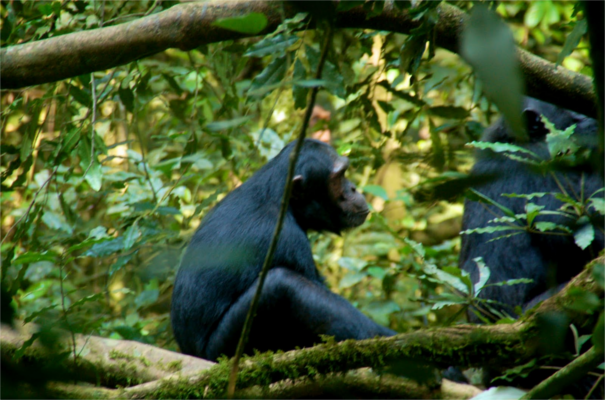 Almost all visitors to this part of Uganda include a visit into Kibale Forest to see the habituated chimpanzees and other primates in this lovely old forest. Kibale Forest covers an area of 795km square; 1100-1590m ASL; dominant vegetation type is rainforest similar to Afro-montane and western lowland forest, also includes grassland and swamp; around 350 trees identified, loads of orchids and epiphytic ferns; especially good for its chimpanzees (around 1,450 individuals in total with around 80 habituated, the largest single population in Uganda); also very good for birds including 335 species with 6 Albertine rift endemics; Kibale has around 144 butterfly species (including Africa’s largest and rarest, the Giant Swallowtail); 60 mammals including 13 primates; forest elephants are around in the wet season but rarely seen. Most excursions last for 2 to 3 hours and start from Kanyanchu at 08:00 and 15:00 daily. Chimp Treks cost USD150 including park entrance. Chimp sightings aren’t guaranteed but success rate is around 90% with a well habituated community around Kanyanchu. The chimp tracking is easy-going by comparison with Mahale and Kyambura Gorge, definitely a lot easy than gorilla trekking. Wear light layers but be prepared for rain in season – keep it simple in Kibale. Shooting photos of chimps is a lot more difficult than shooting gorillas. They’re far more active and regularly at ease behind heavy foliage or up high in the canopy and then on the move again. Opportunities on paths can be quite good especially if you’re set for low light, and you’re lucky enough to be tracking on the path when suddenly things come to a complete standstill. All in all they make very difficult photographic subjects but are seriously interesting especially since they actually don’t give a hoot for people. In addition to short treks full or multi-day chimpanzee habituation experiences are available for around $220/$400/$550 for 1/2/3 days respectively. They entail a full day’s tracking with researchers and habituators from around 05:30 to 19:00 – available March, April, May and November only. This is exceptionally good value for people with a real interest in chimps and the forests! Even if there’re no chimps the forest is truly outstanding. In addition to chimps, Kibale is home to the following primates: dwarf bushbaby, eastern needle-nailed bushbaby, Bosman’s potto, dwarf galago, black & white colobus, Uganda red colobus monkey, Uganda redtail guenon, blue guenon, Lhoesti or mountain guenon, vervet monkey, grey-cheeked mangabey and olive baboon. Start at Kanyanchu and run from 08:00 to 22:00, aimed at sighting nocturnal primates especially potto and bushbaby; costs $70 including park entrance. A community run initiative that protects the Magombe Swamp just outside the area. Good for primates and butterflies but the 4.5 km trail is one of the best guided bird trails in East Africa. Local guides are especially good, keen birders should book in advance, collar the best guides and aim to leave around 14:00 for a good 3-4 hours of private birding focusing on looking for specials. The swamp is home to 138 species. Western Uganda from the Albertine Rift to Ruwenzoris and Virunga mountains has one of the world’s densest concentrations of volcanic crater lakes. There are 4 main groups of these crater lakes: Kasenda cluster west of Kibale; Katwe cluster not far from Mweya in Queen Elizabeth National Park; Fort Portal cluster to the north and the Bunyaruguru cluster southeast of Queen Elizabeth National Park. The Kasenda cluster is the most extensive and easily accessible from Kibale. These lakes offer lots of possibilities for exploration with verdant bush, great landscapes and lots of birds, butterflies and other wildlife. Ndali Lodge , Papaya Lodge and Crater Lake Safari Lodge are probably the best spot from which to explore the crater lakes and surrounds.